Hello, book lovers! Shelf Indulgence is a new bimonthly book review column from A.D. Garrett. Occasionally, when my reading muscles are well-toned, I’ll do a one-off top-up which will be listed as Shelf Indulgence – unplugged. The main column will appear first in Heswall Magazine, recommending two books. They will be recommendations, rather than harsh critiques, because this is all about indulgence. My tastes are eclectic, so you will find a mixture of styles and genres, both fiction and non-fiction in Shelf Indulgence, as well as a mix of new and old. Expect the conventional alongside the unconventional, and recent publications rubbing shoulders with a few old favourites. Peter Brown is a resident physician in Manhattan’s worst public hospital. A gentle, intellectual Jewish boy who set out to revenge a double murder and on the way became the Mob’s most feared hitman. He lies, he kills – but always with a conscience. He’s also an expert in martial arts and the art of survival – and it takes every ounce of his resourcefulness to stay alive when the Mob come after him. This weird and wonderful creation combines the wicked charm of Jeff Lindsay’s Dexter with the Tarantino’s graphic violence. Beat the Reaper is inventive, ebullient, and charged with an energy that is half rage and half sheer joyful exuberance. Bazell uses footnotes to explain human biology, science and even historical background on the Holocaust. It might throw you at first, but bear with it: the information is peculiarly seductive, and Bazell’s presentation of the facts playful and shocking in just the right measure, so that you’ll find yourself looking forward to his brief asides. 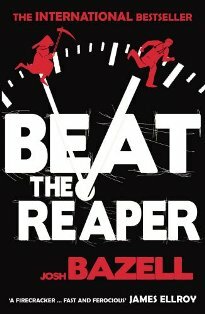 Beat the Reaper is a preposterous, funny, exciting, glorious piece of fiction – Josh Bazell doesn’t tap politely at crime fiction’s door and wait for admittance: he charges in and kicks the door down.